Synopsis: She’s back! 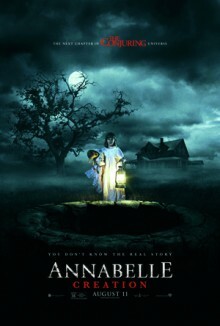 From New Line Cinema comes “Annabelle: Creation”, with David F. Sandberg (“Lights Out”) helming the follow up to 2014´s hugely successful “Annabelle”, which scared up nearly $257 million at the worldwide box office during its run in theaters. The new film is once again being produced by Peter Safran and James Wan, who also partnered so effectively on “The Conjuring” movies. In “Annabelle: Creation”, several years after the tragic death of their little girl, a dollmaker and his wife welcome a nun and several girls from a shuttered orphanage into their home, soon becoming the target of the dollmaker’s possessed creation, Annabelle. Sandberg directs from a screenplay by Gary Dauberman, who also wrote “Annabelle.” The film stars Stephanie Sigman (“Spectre”), Talitha Bateman (“The 5th Wave”), Lulu Wilson (upcoming “Ouija 2”, “Deliver Us from Evil”), Philippa Anne Coulthard (“After the Dark”), Grace Fulton (“Badland”), Lou Lou Safran (“The Choice”), Samara Lee (“Foxcatcher”, “The Last Witch Hunter”), Tayler Buck in her feature film debut, with Anthony LaPaglia (TV´s “Without a Trace”) and Miranda Otto (Showtime´s “Homeland”, “The Lord of the Rings” Trilogy). Collaborating with Sandberg behind-the-scenes from his “Lights Out” team are production designer Jennifer Spence and editor Michel Aller and composer Benjamin Wallfisch; joined by director of photography Maxime Alexandre (“The Other Side of the Door”) and costume designer Leah Butler (“Paranormal Activity 3 & 4”). Currently scheduled for release on August 11, 2017, “Annabelle: Creation” is a New Line Cinema presentation, an Atomic Monster/Safran Company production. The film will be distributed by Warner Bros. Pictures, a Warner Bros. Entertainment Company. VIP seating winners will be selected and notified on Monday, August 7 after 5:00PM CST. Winners will be notified via email. Join LatinoScoop at an exclusive advance screening of ANNABELLE: CREATION in select locations below. Click on the link below for your city. If you download a screening pass and aren’t able to use it, please share it with someone who can attend. There are limited number of passes available for each location. Screening passes are available on a first-come, first-serve basis. Additional passes will not be added once they are all redeemed. All advance screenings will take place on August 9. Anyone downloading a screening pass is advised to arrive early to secure seating. The theater is intentionally overbooked by the studio to ensure a full house. Plan accordingly to arrive with enough time. advance movie screeningsANNABELLEANNABELLE CREATIONAnthony LaPagliaDavid F. SandbergGrace FultonhorrorLou Lou SafranLulu WilsonMiranda Ottomovie screeningsmysteryPhilippa CoulthardSamara LeeStephanie SigmanTalitha BatemanTayler BuckthrillerWarner Bros.